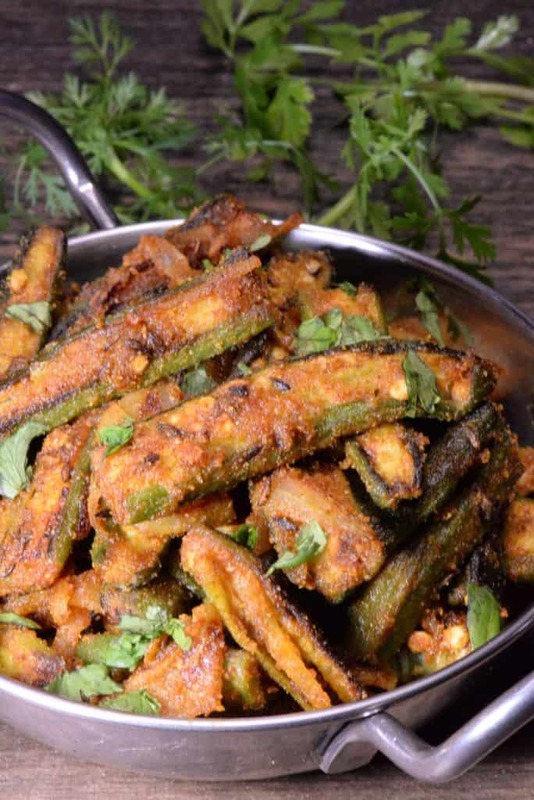 Indian Bhindi Masala dry fry is a spicy fried okra that we served as the starter to our vegetarian Indian meal. It was outstanding. They did not have that gelatinous texture that okra usually has because it is perfectly dry before you start to cook it. It is the water that brings out that texture in okra that takes some getting used to if you are not familiar with it. So if you have avoided this delicious vegetable called bhindi in India, this is chance to fall in love. slice off the crown and tip of each bhindi. then slice them vertically. also slice 1 medium onion. chop 1 large tomato and slit 2 green chilies. crush the ginger and garlic in a mortar-pestle. heat 3 tbsp oil in a thick bottomed shallow frying pan. add the sliced onions. saute them till they start turning light brown. now add 1 tsp ginger-garlic paste and the green chilies. now add the chopped tomatoes. stir well. add ¼ tsp turmeric powder, ¼ tsp red chili powder, ½ tsp coriander powder, ½ tsp cumin and ½ tsp dry mango powder. mix the spices with the rest of the onion-tomato masala. saute this mixture till the tomatoes become pulpy and you see oil releasing from the sides. now add the chopped bhindi/okra. season with salt. stir very well. cover the pan with a tight fitting lid and cook on a low flame or simmer. check after 4 to 5 minutes a couple of times. cook the bhindi fry on a low flame till the bhindi is done. you will have to check after every 4 to 5 minutes so that the bhindi does not get too browned or burnt. Stir every time when you check it, if the okra is becoming too browned or getting burnt, then sprinkle 1 to 1.5 tbsp water all over. stir, cover and continue to cook. once the bhindi is done, add ¼ tsp garam masala powder and ½ tsp kasuri methi/dry fenugreek leaves, crushed. stir very well. lastly add 2 tbsp chopped coriander leaves. stir.